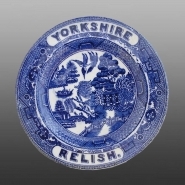 The second example of Goodall's advertising plates is shown here with "YORKSHIRE" within the border on the top of the plate and "RELISH" on the bottom. 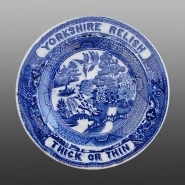 The third example of Goodall's advertising plates has "YORKSHIRE RELISH" printed within the border on the top and "THICK OR THIN" on the bottom. The Goodall Company produced numerous advertising materials promoting their products. This is an example of a small paper pamphlet with the Standard Willow design on the front. The brochure includes a version of the willow pattern story titled The Song of the Willow Pattern written by Minnie Child and it extolls the virtues of Goodall's Yorkshire Relish. 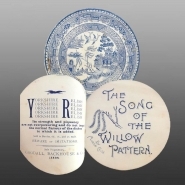 A small earthenware advertising plate printed in blue with the Standard Willow pattern. The version recorded here carries the maker's name "GOODALL'S" in the border at the top and "YORKSHIRE RELISH" on the bottom.. There are three known versions of this plate, the other two are shown below. Yorkshire Relish was produced by Goodall, Backhouse & Co. of Leeds, and their advertising material described it as "the most delicious sauce in the world".